07. The threat of invasion. The organisation of the plans was delegated to magistrates in their respective Divisions. Dr Salter of Tolleshunt Darcy was the leader of Witham Division. There was correspondence in December 1914 and January 1915 about his alleged incompetence, and the hopes of the Lord Lieutenant to remove him (he probably failed) (ERO L/P 3/5). Essex Yeomanry peace-time part-time, originally in Napoleonic Wars, farmers on horses, used as police 19th cent in other parts of country. After Boer War, new yeomanry regiments, i.e. Essex Yeomanry Regiment, the four 4 hunts, basis for 4 squadrons. In August 1914 Yeomanry, and Territorials (weekenders) made full-time. Horses surveyed and in due course requisitioned. Essex Yeomanry and other Yeomanries to coast of UK on mobilisation. Trenches dug across Essex. Thames, Chelmsford, North Weald, for defence. Volunteer Training Corps dug them. Old and young, like Home Guard. Wiring. At Rivenhall et al also. Field training. Eight Battalions of volunteers at home – old, young, unfit or reserved. 17th October 1914. Lord Lieutenant, Earl of Warwick, received confidential letter from Home Office re possibility of invasion here. Policy that civilians should remove transport. Not flee as would block roads for military. No individual sabotage. How to tell public? Approved of individual committees (were some already) and suggested more. Lords Lieutenant from all Counties met in London. ?date. At Chelmsford called meeting of TA officers, Deputy Lieutenants and Police chiefs (Note, surprising, elected authorities no role then). Chairmen of Petty Sessions to be asked to nominate local committees. To suggest six or seven discreet persons. Confidential. Most replied with names. Some including Dr Salter of Tolleshunt Darcy tried to find more. End of December before had names eventually. Authorities cut[?] 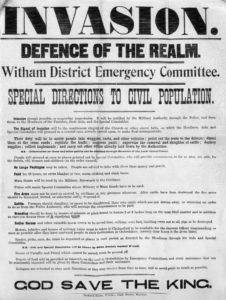 Dr S as chairman of Witham Division. Lord Lieut suggested he should resign chairmanship. Dr Salter responded with anger. Instructions by Home Office: remove transport, remove livestock, destroy food, supply tools, control traffic, give instructions to civil population. All plans still to be confidential. County Emergency Committee met. Considered Home Office circular and lists of members. Meeting of local committee chairmen later. All anxious about population especially if not allowed to instruct beforehand. Especially thought would be difficult to get them to stay at home. Col. Kemble read out piece re Napoleonic Wars from People’s History of Essex – people had been warned then. Lord Lieut worried about civilians shooting Germans. HG Wells writing encouraged this. Committees appointed helpers in every parish. Generally one or two. More near coast where more vulnerable. Census of horses, animals, grain, etc. Illuminated the problem about how to destroy things especially animals. Romford Committee wanted pistols to help but refused. Home Office circular promised compensation afterwards. But how to prove value? Chief Constable said police would issue voucher but what if too busy. Debate about whether to destroy alcoholic drink or not. Army Council said would mean too much compensation and not necessary. One local said should destroy because Germans were worse when drunk. Food – what were civilians to eat. Local Committee plans, often in leaflet to households. E.g. roads for military and roads for civilians. Cattle to be slaughtered. Get youths to put arrows showing way out. Armbands for organisers. Shut but don’t lock doors. Warning, church bells etc. Colchester to have three rockets three times. Public warning by posters instead. Home Office stressed no immediate threat. Inevitable alarm from people going round to check requirements etc. Change re publicity since December. HO allowed publication of plans once made. Problem, what to do in Herts. Actually Herts had plan to receive Essex refugees but didn’t tell Essex till later. First conference with Essex and other counties. Suggested women be appointed to committees to help, e.g. with housing. Several Committees decided wouldn’t be any use. Military representatives on Committees (e.g. Arnold Bennett on Tendring, lived at Thorpe le Soken). Spy scares. AB said find people whose loyalty not sure of. Gustav Holst suspected but eventually put down as harmless. Military wanted to veto EC plans but didn’t offer alternatives. Military concerned with keeping control and Emergency Committees with evacuation. Who to exert authority. Decided originally would be police under military authorities, but this disregarded in evacuation plans which emerged. Evacuation plans assumed parish committees would organise evacuation. Conflicting instructions about who in charge. Chief Constable eventually said would be Special Constables as police too busy. ECs should cooperate with SCs. But would be panic etc. Protests from Committees. Ld Lieut also put out because Chief Constable hadn’t consulted him. Earthworks Ingatestone, Rayleigh etc round London. If within that, not allowed to move. Cancel plans re roads within this area. Local committees to control population only. Military would commandeer transport. Review evacuation plans all over. Withdraw printed instructions. Ecs angry. By 1916, what plans in operation. March 1916. Ecs to review and report. New military organisation. Chief thought raid unlikely. But reports from local committees slow. 16 August. Home Office revised instructions. Army Council had said don’t destroy all food and don’t evacuate population unless heavy bombardment. Possibly partly because fewer men at home. Necessary to revise plans. Some Ecs said why not keep existing plans and use for instance if bombardment or if people went anyway. Chief Const said yes. Home Office less keen. Locals criticised confusion especially whether evacuation necessary. Committee reps complained. General Haig. Scheme re food depots. Established by April 1918 e.g. Chelmsford, for coastal refugees. Army biscuits and cocoa. Correspondence re free petrol to committees. July 1918. Committee met. Transport to remove. Army had set out roads for refugees. 11 August 1918. Test run. Tendring. People collected. Scouts etc. cycled about as mock evacuees. 8 August 1918. British offensive. October. Home Office letter warned against relaxing arrangements. Only disbanded Ecs a month after end of war. Letters of thanks. No evidence of Emergency Committees in written accounts of War. page 5. Peace festivities. General comment.